The first thing that should pop into your head the next time you are at Trader Joe's is their new Trader Joe's Popcorn with Herb's and Spices. Snacking has now become perfectly popped and bite sized with a subtle olive oil, herb and spice flair! Grab a hand full on the go or serve as an appetizer at a dinner party. There's no need to bring a magician to this party as this new item seems to have no trouble disappearing quickly into your mouth! 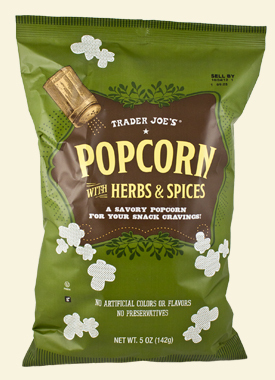 Get nutrition information for Trader Joe's Popcorn with Herb and Spices. Fun Fact: Americans consume 17 billion quarts of popped popcorn each year. That's enough to fill the Empire State Building 18 times! This is Delishhh. If you love TJ's try this product!